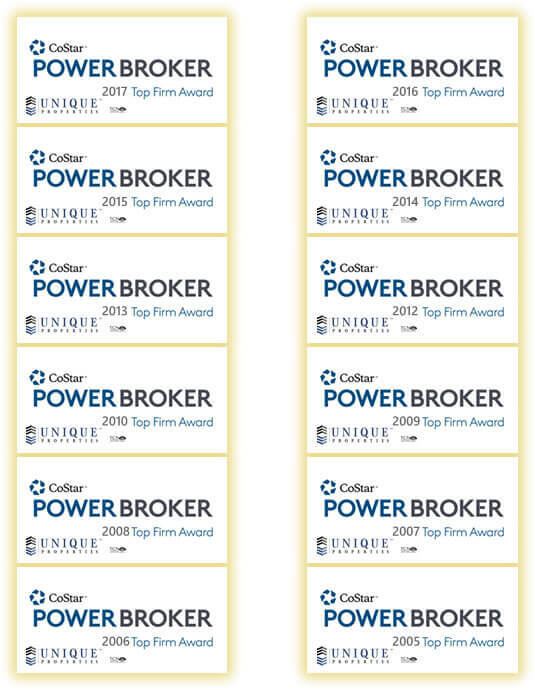 Denver, Colorado – Unique Properties has been selected by CoStar Group, Inc. (NASDAQ: CSGP), the leading provider of commercial real estate information, analytics and online marketplaces, to receive a CoStar Power BrokerTM Award. This annual award recognizes the “best of the best” in commercial real estate brokerage by highlighting the firms and individual brokers who closed the highest transaction volumes in commercial property sales or leases in 2018 within their respective markets. This Is The Thirteenth Year In-a-Row Unique Properties Has Been Honored To Receive This Prestigious Award. CoStar Group, Inc. (NASDAQ: CSGP) is the leading provider of commercial real estate information, analytics and online marketplaces. Founded in 1987, CoStar conducts expansive, ongoing research to produce and maintain the largest and most comprehensive database of commercial real estate information. Our suite of online services enables clients to analyze, interpret and gain unmatched insight on commercial property values, market conditions and current availabilities. LoopNet is the most heavily trafficked commercial real estate marketplace online with more than 10 million registered members. Apartments.com, ApartmentFinder.com and ApartmentHomeLiving.com form the premier online apartment resource for renters seeking great apartment homes and provide property managers and owners a proven platform for marketing their properties. Through an exclusive partnership with Move, a subsidiary of News Corporation, Apartments.com is the exclusive provider of apartment community listings across Move’s family of websites, which include realtor.com®, doorsteps.com and move.com. CoStar Group’s websites attracted an average of more than 22 million unique monthly visitors in aggregate throughout 2015. Headquartered in Washington, DC, CoStar maintains offices throughout the U.S. and in Europe and Toronto with a staff of approximately 2,600 worldwide, including the industry’s largest professional research organization. For more information, visit www.costargroup.com.